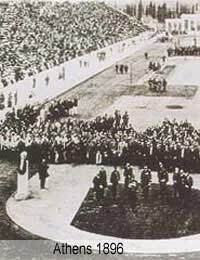 Few who witnessed the opening ceremony at the first modern Olympiad, at Athens in 1896, would believe the elaborate and extravagant ceremonies that go hand-in-hand with the Games in the 21st century. London 2012 has already had a taste of Olympic and Paralympic ceremonies. The city officially became the host of the next summer Olympics during an eight-minute presentation as part of the closing ceremony of the Beijing Games on 24th August 2008. A double-decker bus, England footballer David Beckham, Led Zeppelin lead guitarist Jimmy Page and X Factor winner Leona Lewis took part as Boris Johnson, the Mayor of London, was handed the Olympic flag. Now plans are underway for the London 2012 torch relays, with the route for the Olympic torch relay to be announced in 2011. The route for the Paralympic torch relay is likely to be made in early 2012. The aims of the torch relay are to celebrate and unite sport and culture and spread the spirit of the Games throughout the United Kingdom in the months leading up to the opening ceremony. The torch, which is lit in Olympia, will be carried all over the UK by torch bearers selected through a ballot process. As the Olympic flame passes through communities, there will be concerts, shows and entertainment to mark its arrival. The build up to the Paralympics will also be marked by a UK-wide torch relay in August 2012. The opening and closing ceremonies of the London 2012 Games will be watched by a mind-boggling worldwide audience of one in three people. Music, dance, culture, fireworks and the top athletes from around the world will welcome the world to London and set the tone for the Games. Organisers will draw on the UK’s creative industries, which enjoy a worldwide reputation for excellence, to ensure the ceremonies celebrate the Olympic and Paralympic values and spirit of friendship in a spectacular display of colour and pageantry. Each team competing at the 2012 Olympics and Paralympics will be welcomed to London as they arrive at the Olympic village. The teams will be greeted by the honorary village mayor and their national flag will be raised to join flags of the other competing nations and those of the UK and the Olympic and Paralympic movements. In addition, each event during the Games will be marked by medal ceremonies across the Olympic venues.